The Department of Public Works provides cleaning services for the District. To report a site that needs to be cleaned or to report illegally dumped trash, call the city call center at 311, available 24/7. DPW will investigate within 3 days and it will be resolved within 5 days on public property and 45 days on private property. The Department of Public Works cleans alleys on a rotational schedule – approximately every six weeks in Ward 6. However, alleys that are reported or identified by the DPW as dirty have priority. Call 311 for a special cleanup, or submit a request online here. Special requests are investigated within three days and resolved within 7 to 28 days. Residents and business owners can help keep alleys clean by picking up trash and litter, cutting weeds, and preventing tree limbs from hanging over the alley. During the first two weeks of January, holiday trees, without decorations, are collected by the city. Trees must be on the curb on the Sunday of your collection week. Call 311 for your collection date or to place a service request if you have your tree after the collection period. For more information, call 311 or visit the website. Illegal dumping, such as leaving a mattress in an alley or a bag of garbage on the front sidewalk, can be subject to a fine. Fines for dumping can be up to $5,000. Rewards for information leading to the arrest and conviction of a dumper can be up to $500. Call 311 to submit information about illegal dumping. Between the months of November and January, the city vacuums leaves from each street two times. The cleanup schedule is included in a Leaf Collection Map, which District residents receive each fall. Leaves must be raked to the curb into a pile in the tree box space by the Sunday of the collection week. Place leaves from the rear of the property where trash and recyclables are picked up. Remember to not pile leaves in the street, park on leaf piles, or block gutters or storm drains. No more than seven bags may be picked up at each address. Call 311 if leaves were missed or there is a special circumstance. Complaints are investigated within 3 days and resolved within 2 weeks. Visit the DPW website for more information. Call 311 or visit the DOH website for more information. The Department of Public Works issues recycling containers for residents and recycling pickups on trash collection days. The recycling schedules can be found here. Call the recycling hotline at 202-645-8245 or the DPW website for a list of recycling “dos and don’ts.” All recyclables are taken to a Materials Recycling Facility to be separated and prepared for market. If you need a replacement or additional bin, call 311. 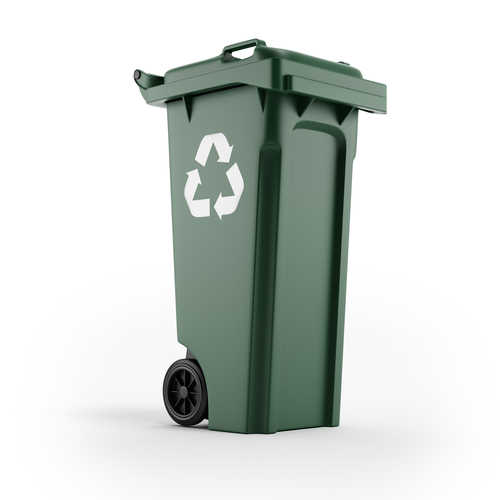 Trash and recycling cans are issued to residents in buildings with three units or less. Call 311 or visit dpw.dc.gov to place an order for a can. It will be delivered for free within a week. Residents receive regularly scheduled trash collection, provided by the DPW. In Wards 2, 6, and part of 1, collections are twice a week. In Wards 3, 4, 5, 7, 8, and a portion of 1, pickups are on Supercan routes and are only once a week. Trash cans should be placed on the curb no earlier than 6:30 pm the night before collection day, and no later than 6 am on the day of pickup. Place trash on public property, and against the retaining wall is the building has steps. To deter animals, use heavy-duty plastic or metal cans, and pour ammonia or bleach on contents within plastic bags. Between collections, keep trash cans and Supercans on your private property, not the alley or sidewalk. Please inform the DPW if a collection was missed or trash spilled so a supervisor can inspect and a crew can clean up and collect. Bulk collection is available to households with no more than three units. Seven items may be picked up at one time. This includes large appliances, furniture, mattresses, small appliances, and tree limbs cut and tied into bundles. If you are getting rid of large appliances, such as refrigerators, please remove the doors before collection. For more than seven items, schedule an appointment by calling 311 and include instructions for locating the items.